On Saturday the 8th and Sunday the 9th of July, Eastern American Diocesan vicar Bishop Nicholas of Manhattan visited the Diocesan Center in Howell, NJ, for the celebrations in honor of the patronal feast day of Our Lady of Tikhvin Church. The church was built 81 years ago, and originally – before the construction of the new cathedral – had been consecrated in honor of the Holy Right-Believing Great Prince Alexander Nevsky. 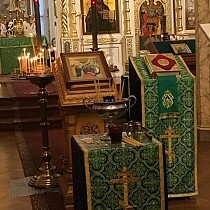 On July 9, His Grace led the All-Night Vigil, co-served by cathedral clergy: dean Archpriest Serge Lukianov, Archpriests Boris Slootsky, Seraphim Chemodakov, and Peter Hnatkivskyy, and Protodeacons Leonid Roschko and Paul Drozdowski. Hymning the service was the cathedral’s male choir, in which cathedral Protodeacon Leonid Roschko took part. On Sunday, July 9, after the reading of the hours, the greeting of Bishop Nicholas took place. Fr. Serge greeted His Grace and invited him to pray at the festal Liturgy alongside the clergy and a multitude of parishioners, who had gathered from various cities and nearby states for the church’s patronal feast. At the start of the service, Bishop Nicholas tonsured Holy Trinity Seminary student and longtime cathedral acolyte Mykola Ivanchuk a reader. During the service, three lovingly adorned icons of the Tikhvin Mother of God were put out for veneration by the faithful, all of which possess a rich history. In accordance with tradition, a multitude of the faithful received Holy Communion. Upon completion of the service, Bishop Nicholas congratulated the clergy and parishioners on their patronal feast, and addressed those gathered with a sermon, in which he said, in part: "We know that, for the parish, its patronal feast is a second Pascha. Pascha is the feast of feasts, and we rejoice that Christ has by His death defeated death and granted us life eternal. Thus does the Holy Church magnify the patronal feast… Let us, then, thank God and glorify Him for giving us this church. Let us remember all of the former clergy, laborers, and parishioners of our church. Let us pray for the living clergy and parish laborers, especially on this festal day." His Grace noted that, "Our protection is the protection of the Most Holy Theotokos. She shows each one of us the greatest mercy. From her life, we can draw from two of her characteristic attributes: humility and obedience. When the Archangel Gabriel appeared to her and proclaimed the glad tidings that she would bear the Savior of the world, the Most Holy Virgin answered him with deep and simple words: ‘Behold the handmaid of the Lord,’ thus fully displaying her obedience to God. "Her second attribute is humility. Throughout her life, even when Christ went out with His disciples to preach, the Most Pure Mother of God was with them, too. She saw the miracles, heard the teachings, and acted very humbly. Even her clothing was humble. When they crucified her Son, she was there at Golgotha. A sword pierced her heart. She stood and watched as the people raged and shouted. The Mother of God suffered, but prayed to God for those who were committing this terrible crime. "For us today is both a joyous and instructive day," continued Bishop Nicholas. "Let us thank the Lord that we have this wonderful church, even two churches, where the divine services and all of the Sacraments are performed, where the Most Holy Theotokos abides with us; let us pray to her, follow her example, and let us, like her, be obedient and humble. And in this way we will obtain mercy and grace from the Lord." Bishop Nicholas then served a short moleben to the Most Holy Theotokos, and the clergy and faithful, taking icons and banners, held a procession around Our Lady of Tikhvin Church. Fr. Serge congratulated everyone with the feast and thanked the donors and laborers who had worked for the past two weeks painting the church. He congratulated the new Reader Mykola on completing the first year of seminary and wished him physical and spiritual strength in order to worthily continue his education in seminary and his service in the church. All were then invited to the church hall, where the cathedral sisterhood prepared a festal luncheon. 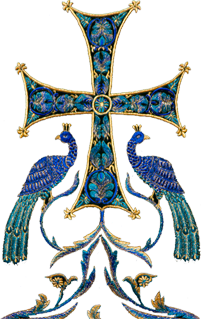 At lunch, the cathedral’s pastor emeritus, Protopresbyter Valery Lukianov, spoke about the history of the parish and about little-known details in the history of the Tikhvin Church and its holy icons and relics. Having shared prayer and fraternal interaction with the clergy and faithful, Bishop Nicholas departed for the airport and left for Moscow, where he will take part in the work of the Patriarch Tikhon Russian-American Musical (PaTRAM) Institute.